Acknowledging with a terse, “Got ‘em,” I tried to place my live baitfish a few feet ahead of where the fish would be in a matter of seconds. While the bait was in the air, the two fish turned and my cast ended up behind and to the side. Quickly reacting to the change, Matt’s bait was on its way as mine hit the water. This time the fish didn’t change course. The bait fish hit the water, flashing its shiny white sides. It captured the immediate attention of the two fish and they were on the dazed bait in seconds. The lead fish thrust itself forward and inhaled the offering. Matt set the hook and the fish responded with several strong zigzagging runs away from the boat. In the clear, shallow water of the flat, we watched the entire show; from the time the bait hit the water and fish attacked until the exhausted red was alongside the boat. Sight fishing for redfish in the Ten Thousand Islands is pure fishing excitement. But, it’s only the beginning of the thrills for those who want a unique salt water angling experience. This mangrove-forested wilderness is legendary for snook, tarpon and redfish, three of the most exciting salt water fish to ever swim on this planet. It’s also a pretty exciting place to catch spotted seatrout, mangrove snapper, jack crevalle, ladyfish and black tip sharks. This potpourri of powerful fighters and aerobatic leapers is enough to classify the mangrove coast as an angler’s utopia. Anglers wonder more about how many fish they’ll catch rather than if they will get a bite. The Ten Thousand Islands are as wild and undeveloped a place as you will find anywhere in the United States. Lining Florida’s southwest coast, the region is a labyrinth of islands and twisting waterways that create a maze-like appearance. Lush, evergreen mangrove trees, practically the only tree growing in the area, provide food, shelter and habitat for a variety of birds, fish and other wildlife. The gateways to this fishing mecca are Everglades City, Chokoloskee and Marco Island, all within an hour’s drive of Naples; two from Miami. Catching a tarpon, snook and redfish in the same day is the southwest Florida version of a Grand Slam. All are year round residents but if you want to catch the biggest of the big three, plan a fishing trip between late February and early June. That’s when tarpon in the 150-pound and higher range, make their annual appearance. When the big fish move north in June, anglers turn their attention to catching the resident 5 to 60 pound tarpon. These fish tend to stay in the deeper water of the passes and deep holes in the tidal rivers. “Catching them on light tackle is a real challenge and makes this a pretty exciting event,” Ward says. Snook and redfish are the heartbeat of the Ten Thousand Islands. The snook with its cavernous mouth and insatiable appetite is strong, agile, crafty, and a good leaper. The redfish, with the shoulders of a wrestler, is the muscle man of the flats. Both are year-round residents and one or the other usually provides anglers with a full day’s excitement. You don’t have to sight fish to catch snook and redfish. Many anglers toss their bait to places where the fish are likely to be. The ideal place to find snook and redfish is along an undulating mangrove shoreline, but not just any shoreline. There are thousands of miles of shoreline and to narrow down your choices, take Captain Mark Ward’s advice. “Look for the places egrets are feeding. They’re after the same small bait fish that the reds and snook are eating.” If there aren’t any birds around, fish around overhanging branches or where trees have fallen into the water. 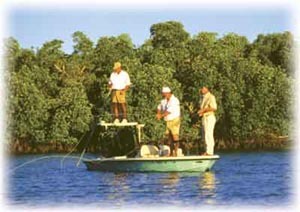 The time of year determines where within the vast Ten Thousand Islands you want to fish. Snook follow a well-defined pattern. During the coldest months of the year, usually January and February, most big snook move up the tidal rivers, often ending up in small water fresh water creeks. In March, as the water begins to warm, snook move towards the coast. During this time you can find snook inside, as locals call the inland bays and creeks or outside, which refers to the tidal channels and bays closer to the Gulf of Mexico. 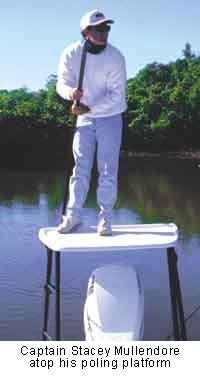 By May and continuing through October, snook fishing is strictly outside fishing. The fish begin to spawn in May and continue into the summer. Snook prepare to spawn in the passes and move just offshore to release their eggs. Although June, July and August are the prime months for snook fishing, the season is closed because of the spawn. Any fish that are caught must be immediately released. After October, the fish will remain outside as along as its warm and the bait fish are around. When the first few cold fronts move through and the bait moves out of the area, the snook head inland. The best time of year for redfish is from August through November. This is when you find the big schools of fish on the outside flats and in the passes. Other times of the year, you may encounter reds just about anywhere in the Ten Thousand Islands, usually swimming alone or in pairs. 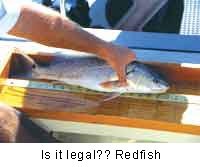 Redfish don’t seem to be too picky about what they eat. 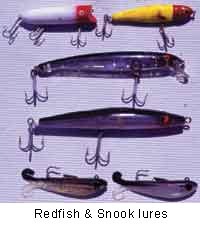 Live bait fish or shrimp, gold or silver spoons, or jigs are the most popular choices. Jigs are very popular because of their versatility. First time anglers to the Ten Thousand Islands, unless they are exceptionally skilled, do themselves a disservice by fishing without a guide or friend familiar with the area. Very few guides take clients out for the day and don’t catch some fish. On the other hand, many supposedly knowledgeable anglers spend a day on their own and come home empty handed. Usually they are fishing in the wrong areas given the time of year or don’t know how to read the water and find the fish. Half day charters are available but are not recommended. You don’t get enough time to fish and experience the natural beauty of the area. A full day charter is the best deal. Prices vary but expect to pay around the $350 range for a full day. This includes your license, all bait and tackle. Your only extra costs will be the tip and maybe a box lunch. Perhaps the most difficult aspect of fishing this angler’s paradise, is deciding which fish is your favorite. As Matt Hoover told me, “My favorite is snook, but I’m real partial to tarpon. I get weak knees over tarpon.” May we all have this dilemma some day.